Note from PC Pitstop: We recently asked our TechTalk contributors to recommend a favorite FREE application or tool that they currently use. This post is the response from Dave’s Computer Tips. I received an email message the other day, nothing unusual about that, except this one emanated from a leading tech site and had been forwarded on to me by Dave. The email posed an intriguing question… what is your favorite freeware application or tool? Uniqueness: It must offer something which no other freeware can offer, some feature or aspect which is unparalleled. Unadulterated: It must be true to the original freeware spirit and free from bundling – toolbars, OpenCandy and the plethora of other generally unrelated cr*p which has become so common place. Unlimited: It must be not be the poor relation in a ‘Freemium’ distribution model, where the free edition is feature limited/crippled when compared to the ‘big brother’ shareware version. Once those elements were all in place, it quickly became apparent where my vote would go, and it’s not to a single freeware but rather a collection of freeware… from Nir Sofer. Nir Sofer distributes freeware in a wide variety of tools and utilities under the NirSoft name; they are all small yet entirely useful, portable, 100% clean, and many are indeed unique. Nir Sofer has been developing freeware for more than a decade and has never, to the best of my knowledge, strayed from the true freeware doctrine. Fairly recently, Mr. Sofer combined many of his excellent products into a single portable application called NirLauncher. 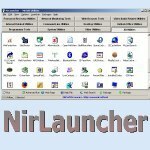 Simply run NirLauncher from the extracted executable, select one of the tabbed categories, and double click the desired tool/utility. All this, more than 100 tools and utilities, is included (in typical NirSoft fashion) in a package weighing in at a mere 13.5MB extracted. Dave's Computer Tips, free software freeware. permalink. What the hell?!? I downloaded and ran “NirLauncher” and on extracting the files, Norton found three password-(reading) files. Needless to say, I ‘cancelled’ and went no further.